What are you willing to do to secure the most likes on your social media account? Some people make fun of others, injuries are faked, and in some cases, you’ll see staged threats. Then you have the fearless daredevils of the group. By daredevils, we don’t mean masked crime-fighters. 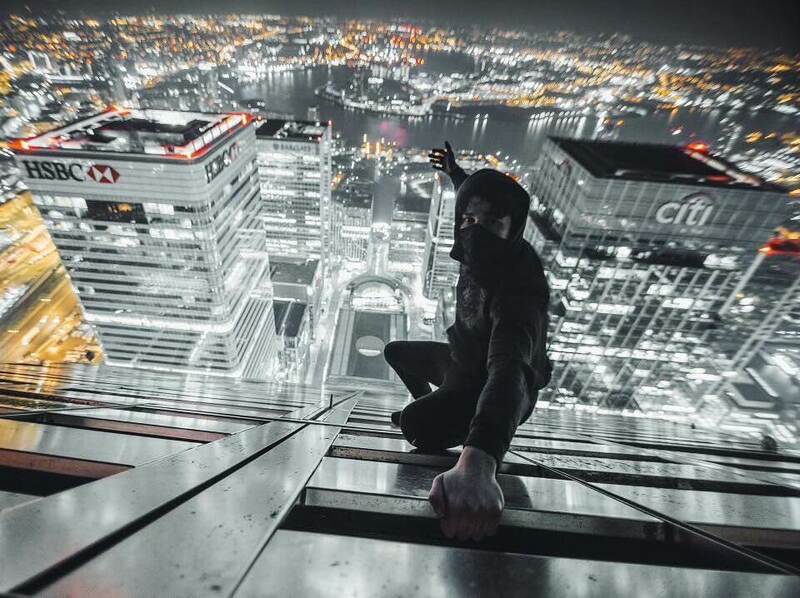 We’re talking about those who will literally hang on to the tallest building in their city with one hand just to get the perfect picture. 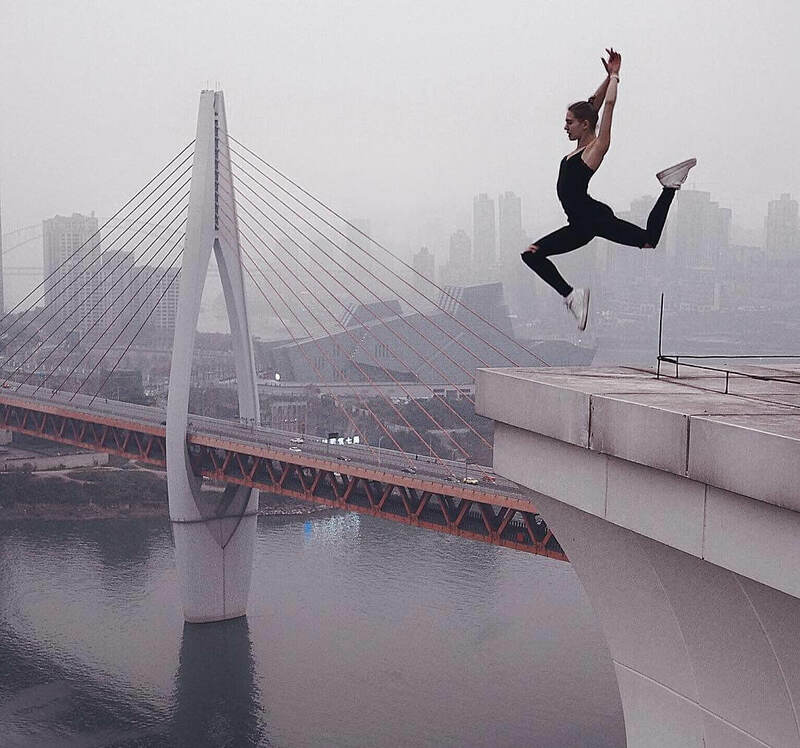 Caution: these pictures may cause sweaty palms, anxiety, or in the best of cases, a surge of inspiration. This picture was taken in Yosemite at Taft Point. It’s nearly impossible not to notice the beautiful scenery. 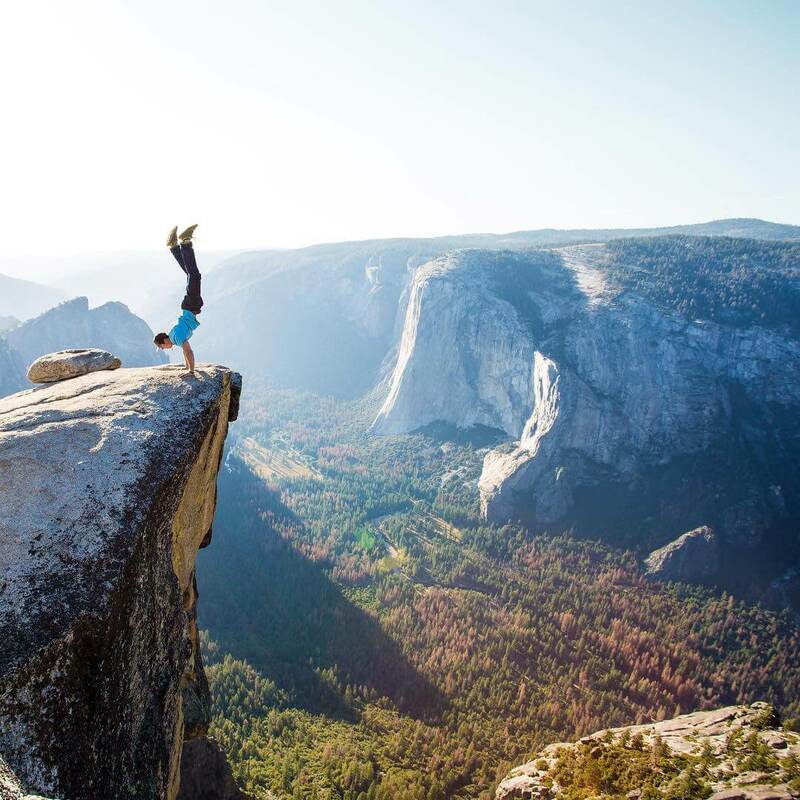 You also can’t help but feel worried for the gentleman pulling a handstand off on the edge of Taft Point. That’s courage and upper body strength! 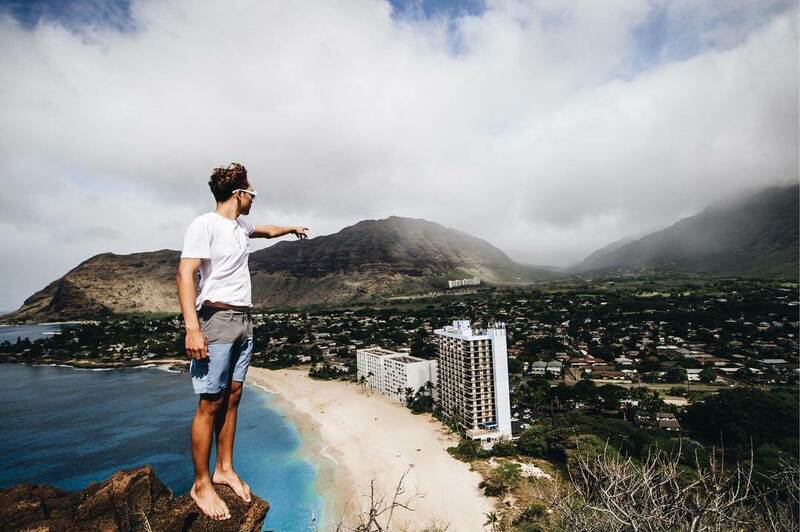 The highest point is 7,503 feet, and he’s doing this like it’s nothing. Like we mentioned in the introduction, what are you willing to do to get likes? Hang on tight, we’re just starting! This is a relationship hanging on by a thread in the best of ways. Hopefully, this guy hasn’t been skipping the gym or else this could have gone horribly wrong. Hovering over the waters in Dubai, even a simple sneeze could have ruined things. The fact that both of them are only using one hand to hang on is impressive. Hopefully, this girl’s parents don’t get a glimpse of this photograph. It might send them into a mini-panic attack. If you aren’t impressed by the beautiful scenery, then surely the man hanging on who looks like a green star will amaze you a bit. There’s no one else around him to help lift him up, so this seems like a double challenge. The first one is getting the likes. The second is proving that he can do it. If you’re wondering where this is, it is in Norway. Your next trip out there can lead you to this suspenseful cliff too. We don’t advise you try this, however; just take in the sights. You may have seen people take photos on this rock before. That doesn’t make it any less terrifying. At any moment, something could go wrong, and that little boulder can fall into the abyss with its victim still on top of it. This place is called Kjeragbolten which is found at Forsand municipality in Rogaland county, Norway. If you’ve been keeping up, that’s already two beautiful places in Norway that are perfect for the adventurous soul. Just pray it isn’t time for that rock in the middle to slip! The first question that comes to mind after looking over this picture for a couple of seconds is an obvious one. How does this guy plan on getting down from the small strip he’s standing on? If there was a random gust of wind, then he might have been toast! The look on his face shows us that he doesn’t fear the height or the scary options of getting back down. We guess none of that matters because he just wants to wow his followers and friends on his socials. It would appear that Dubai has some very courageous individuals roaming around. Her name is Viki Odintcova, and as she’s seemingly a slippery finger away from the longest trust fall ever. You can’t even see how her feet are positioned. In a video of this dare on her Instagram, you see that she’s barely on the edge of this building with the middle of her shoe. The heels of her sneakers are hanging off the edge, and her toes are not touching solid ground either. Someone sign her up for Fear Factor immediately! 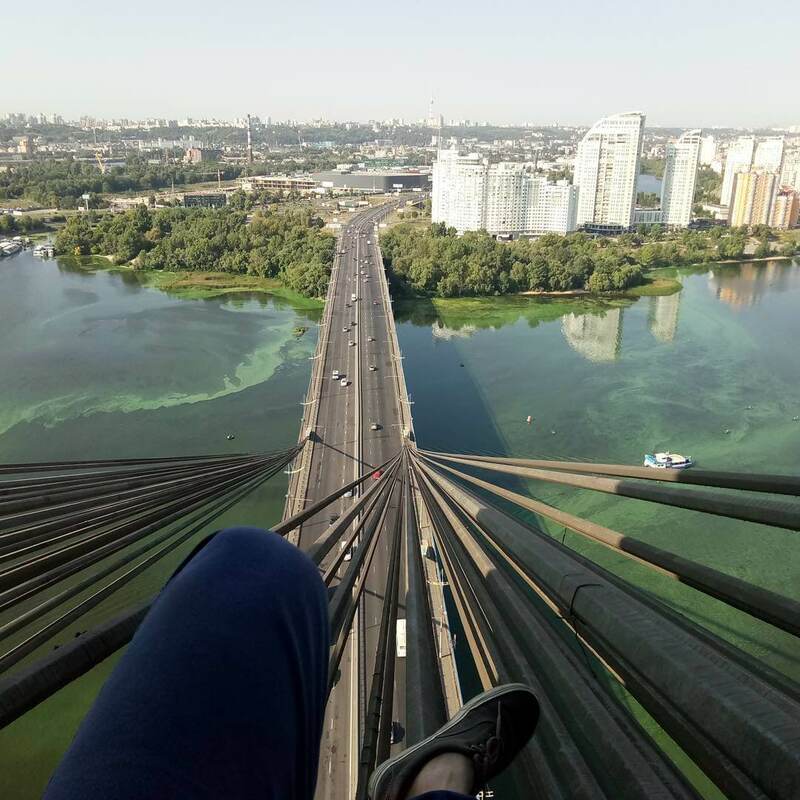 Perching up on the wires of a tall bridge earns you the title of master relaxer. Not only are you above just about everyone else, but you also don’t have to engage in any communication. That’s the best way to relax. Whoever this person is obviously knows the secret to get up there. Either he or she tight walked the ropes or something else elevated this individual up there. Imagine opening a message from your family member, and it’s this picture. There may not be real-life ninjas running around like a Kill Bill movie, but there are definitely those who wish to replicate their ways. Take this man for example. He has the whole outfit down precisely, so we’re surprised he didn’t add a sword on the back. Still, he’s showcasing his skills by hanging onto this building while fearlessly hovering hundreds of feet in the air. That’s all the ninja talent you need to demonstrate to get a like from us. 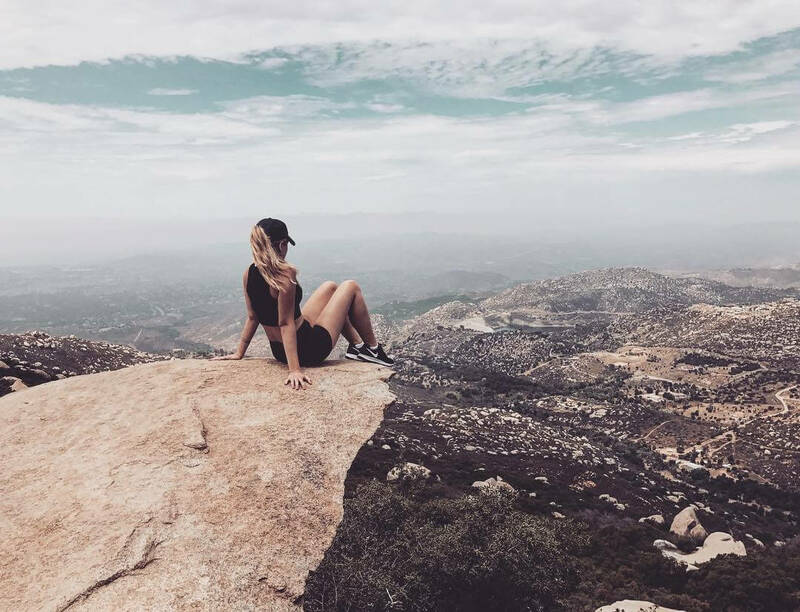 Located in beautiful San Diego County, Potato Chip Rock is a popular tourist attraction. The path to it is also a hike that many enjoy taking, so the reward is a great photo opportunity. Many are aware that the rock may snap at any moment, but still accept the risk. That’s also what makes it more exciting. Knowing that at any moment, your life is in limbo. The “chip” looks sturdy in pictures but it isn’t until you’re on the edge that it starts to frighten you. In the game, users can enter Photo Mode and choose between three camera types, including a “Selfie” option. From there, Spidey can strike five different poses. If he’s perched (like in the photo above), he’ll throw up a peace sign. 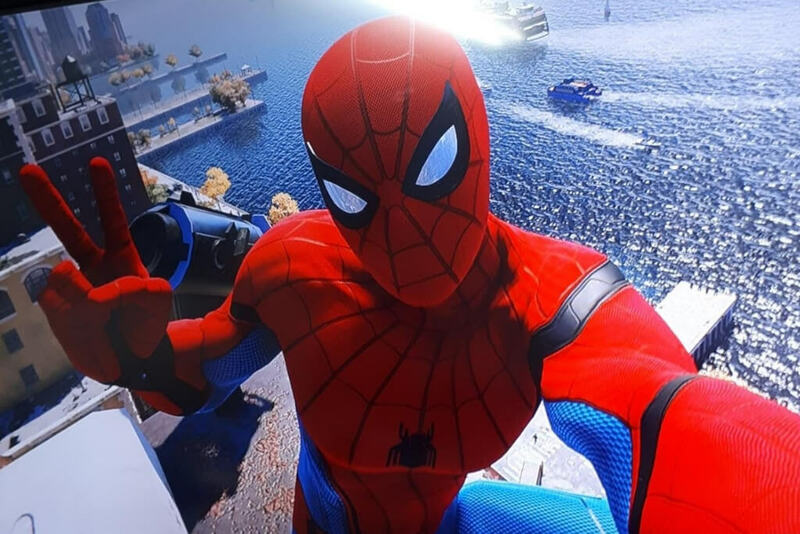 Since Spider-Man can scale impossibly-tall buildings like this one, there’s no limit to how many death-defying selfies you can take. Would you do this flip for a million dollars? Perhaps he just did this for a million likes on Instagram. Either way, the majority of sane people wouldn’t even test the waters with this stunt. How did he know he was going to land that trick safely? All it would have taken was a misplaced toe during the landing and its “bye-bye.” Luckily, he made it out fine. We hope he generated a decent amount of engagement with this post, at least. You know those pictures where the woman is in front with only her backside visible and the hand of the man she’s pulling behind her? Well, this is a behind-the-scenes shot of one of those glamorous photos. The only difference with this one is the fact that they’re walking on a thin strip of a building. Literally, anything will be done to get a once-in-a lifetime picture for social networks. As if all the other images weren’t proof enough, this one should get the point across. What you see here is Pedra Da Gávea. Located in Brazil, it is 2,769 feet in the air which makes it one of the tallest mountains in the world that ends right in the ocean. People go to visit it all the time and take regular photos on top. This is no regular picture. If he had no help while straining himself that high above the ground, then getting back up would be the most robust pull-up he has ever had to do in his life. One word to describe this photo is: edgy. Do you get it? 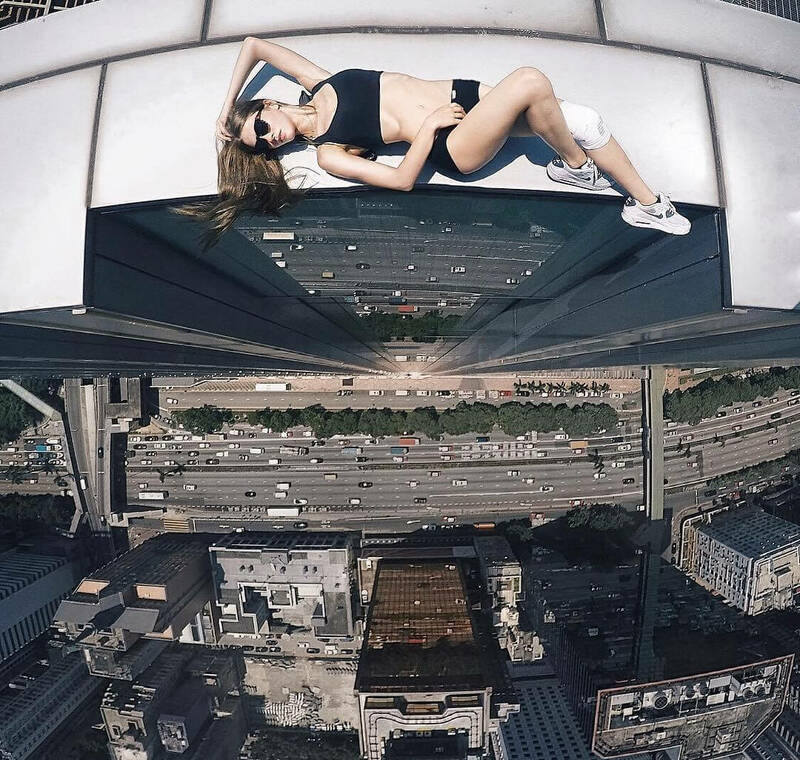 Well, in any event, this Instagrammer is showing a lot of guts by lying down like this on top of that building. Just looking at the picture makes us a little nervous. And where exactly is the camera located? There are a lot of questions to many of these daredevil pictures, but we just let these individuals and couples do as they please. All we can do is sit back and enjoy as we pray they don’t get hurt. What do we have here? An orange and pink sky, a lovely view of the city, and a few Stonehenge-looking figures. That sounds like the perfect backdrop for a fearless couple to take a picture in front of. However, they figured it would be cooler to stand on the stone objects. 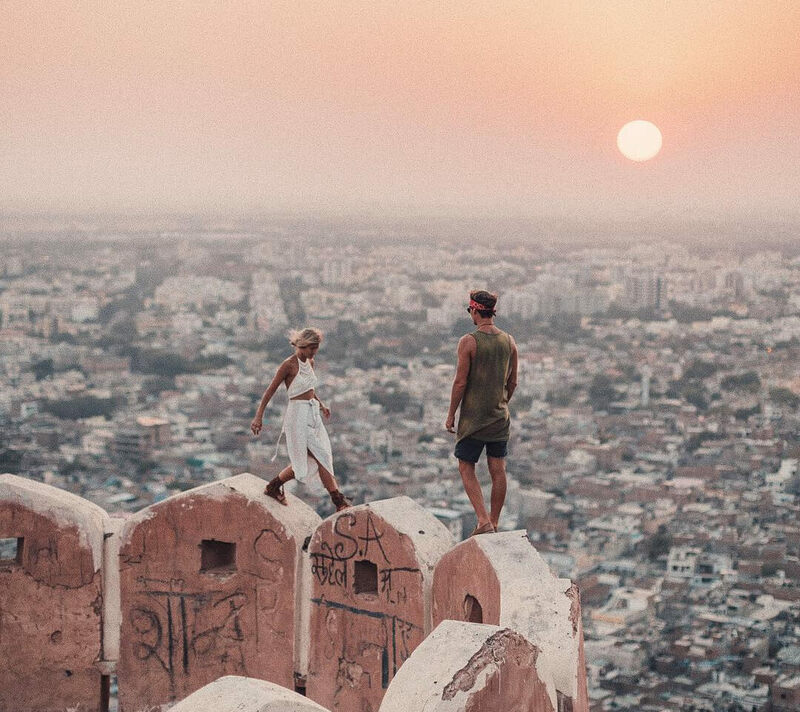 We don’t know how slippery those slabs of stone are, but walking on them doesn’t make this image feel any safer for the couple. This fantastic view can be found in India. 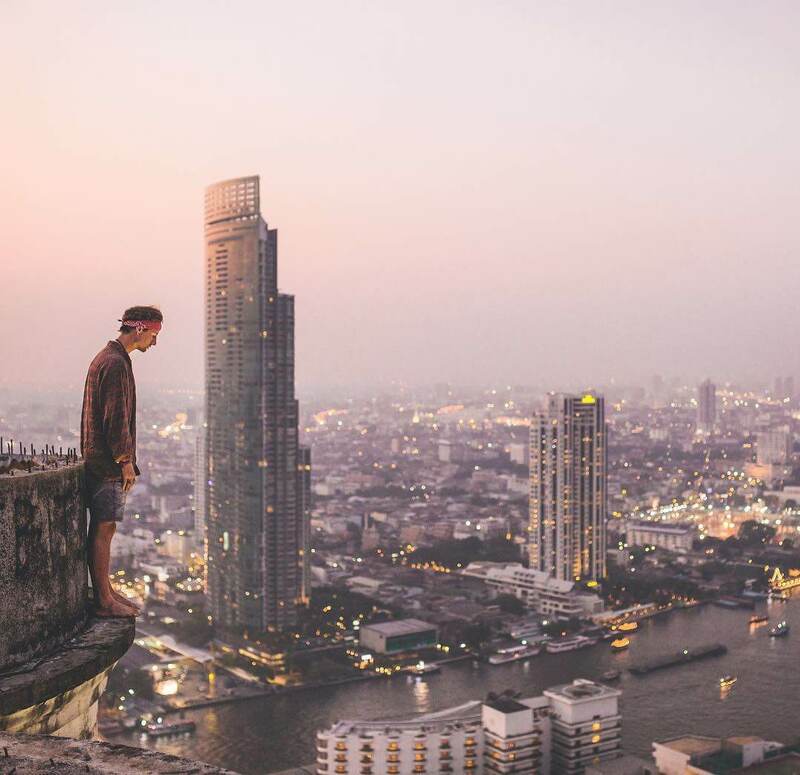 “Back in Bangkok for the next few days,” was the caption this Instagram user captioned this picture with. As if to say he does things like this all the time. And if you browse his profile, you will find that this is indeed another everyday task for him. No shoes, no socks, no fear. Looking down at the ground from a height like that can be genuinely terrifying. He makes it look like child’s play. Just another day in the life of someone who does things like this for a living. Standing inches away from a drop that could end his life, this male is only concerned with pointing at something, but what? Maybe it’s that tall building on the beach, or perhaps that mountain you see in the distance. We don’t know what he’s looking at, so maybe it’s just a pose for Instagram interest. Even though there is a lot of rock behind him, standing that close to the ledge is something many wouldn’t even consider. This tower is located in Tianjin, China. This woman is showing us that the higher up you go, the more likes you accumulate. This picture was posted 26 months ago as of Sept. 26, 2018, and it has received more than 80k likes. And it’s all no big deal to her. She’s using that selfie stick like a pro and even smiles in the face of the elevation. We don’t know if it’s scarier to do the climb up and take the picture or attempt to get back down. 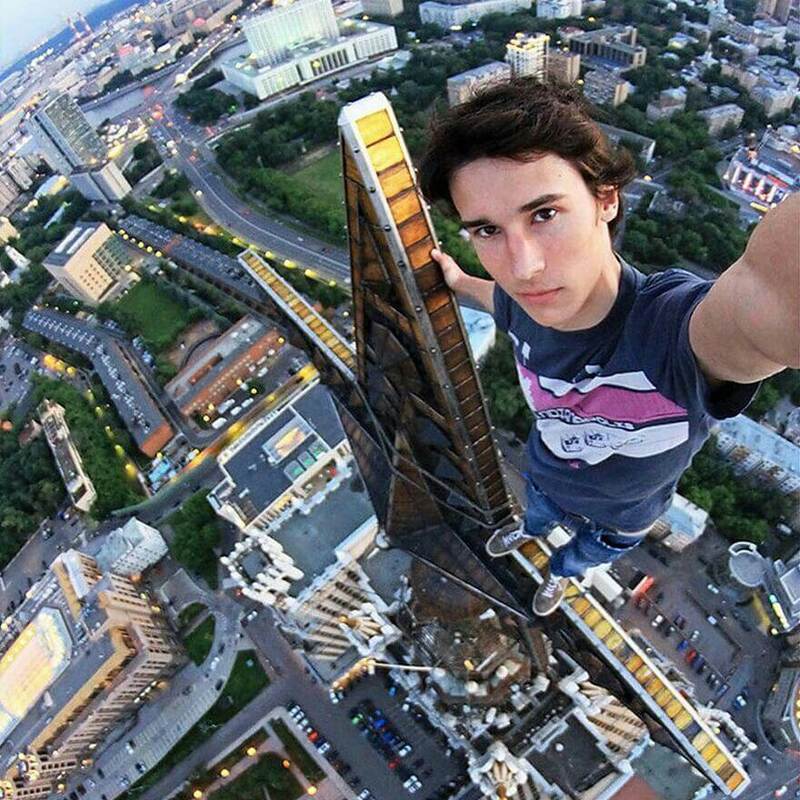 The building this man is hanging from is the second tallest building in Ukraine. And the way he’s hanging makes it look like he doesn’t care about his life. But we’re not here to judge. Whatever he chooses to do with his life is his choice. Social currency seems to be more important than a lot of things these days. Which is probably why you’ve been seeing so many crazy stunts pulled by these social influencers. We’re hoping she practiced this move a handful of times on the grass before she took her talents to this very steep building. She looks like a ballerina who is showing off her skill set. The dangers that lurk in this photo are at an all-time premium. Her leg could have caught a cramp while she was posing mid-air and utterly changed the way she landed. That is all the more reason why she deserves all the likes she can get. The things we do for love. Whoever agreed to go along with this idea must really love that other person. 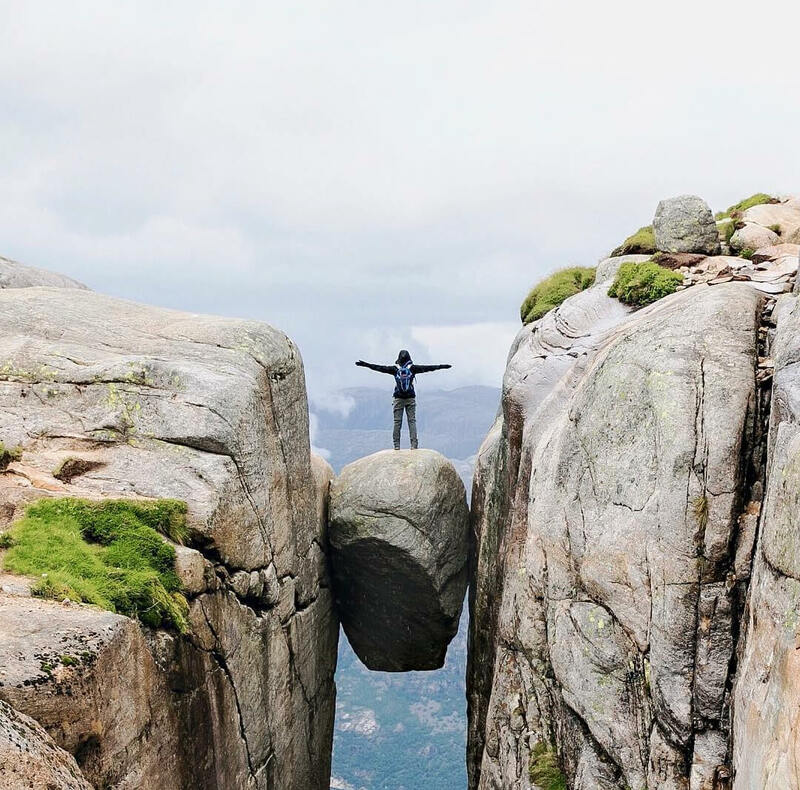 Standing that close to the edge while reaching over can be horrifying because it might feel like you’re about to fall over — even if you aren’t trying to. We suppose this picture is merely a metaphor. It’s telling us that you can’t be afraid of the fall when you’re in a relationship. This is the perfect visual representation of that. When Angela Nikolau posted this she asked her followers where they get their bliss from. Apparently, she gets her bliss from “chilling out and feeling the world” and we suppose her version of feeling the world involves standing at its edge! Here she is on the edge of Shanghai, China. 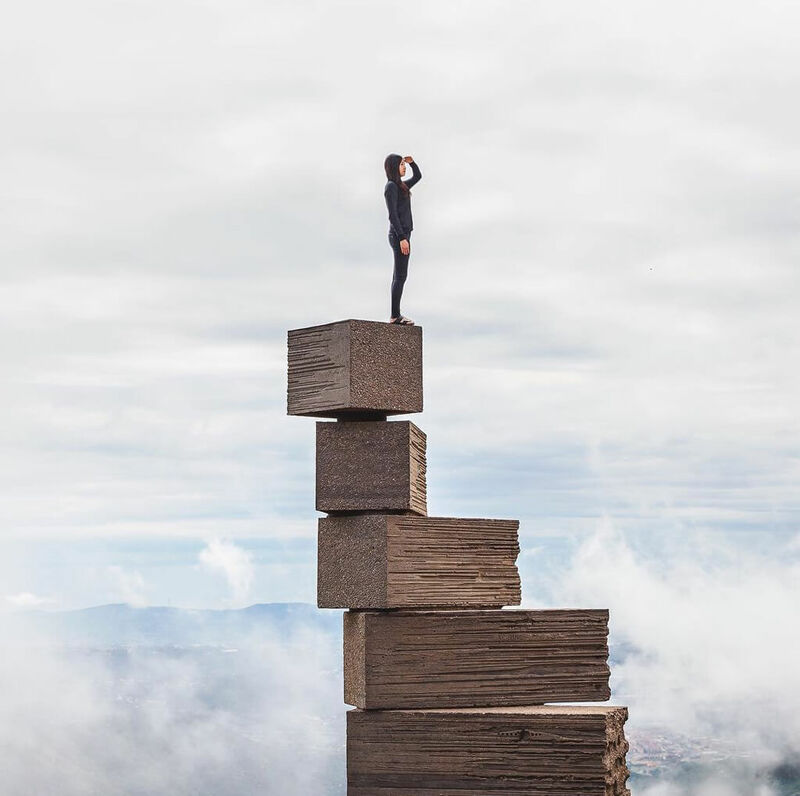 We can only imagine how long it took for her to climb this tower and get the photo because her photographer had to climb it with her to get the shot! Notice his shoes on the upper right edge of the photo, so he’s hanging on too! Teens are always looking for places to sneak off to so they can make out. Looks like this couple found the perfect spot on the edge of a building! Literally no one would think to find them there – we can almost guarantee it. 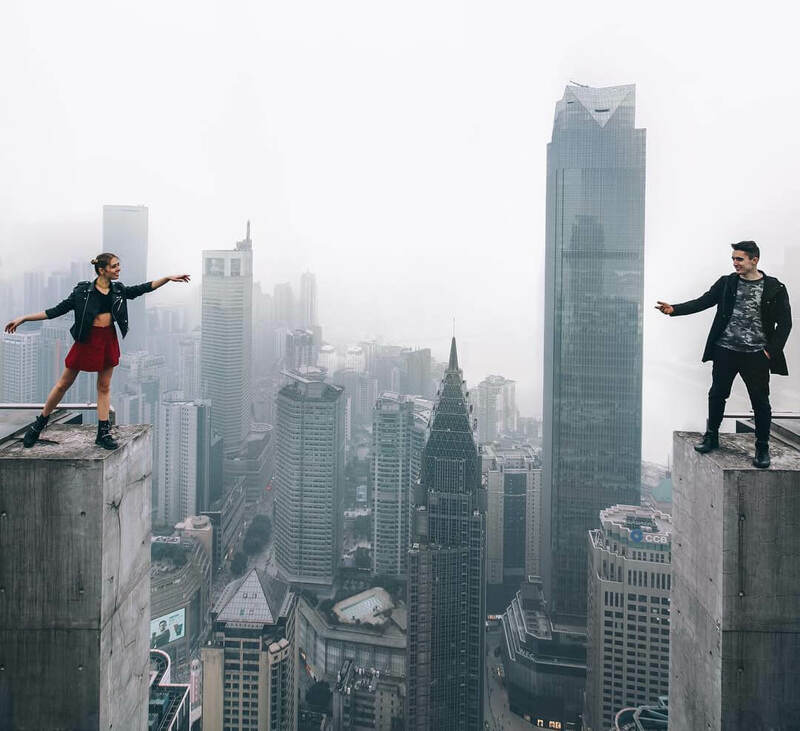 This couple found the perfect place to share a smooch in privacy, but we hope they didn’t get too carried away since that would inevitably cause them to go over the edge. But they are presumably experts at this kind of thing so we doubt that they would have made that mistake. Okay, it’s one thing to even attempt to climb these things and stand on top of them for a photo, but it’s another thing entirely to do this with a whole human sitting on your shoulders! This is in Shenzhen, Guangdong, China. Do you think they both climbed to the top individually and then she got on his shoulders? Or do you think he climbed the guy climbed the entire thing with her on his shoulders? In the latter case, that means these two have some serious talent. They could be acrobats! This is obviously in Paris, France near the Eiffel Tower. We can only imagine the looks she got from the street if people saw her attempting to take this photo! Can you believe that she possibly did this entirely in heels?! There’s probably no better way to experience the City of Lights than from a vantage point like this. From the edge of a building it probably feels like you’re walking straight into a painting. That’s probably why she looks like she’s in a dreamlike state! 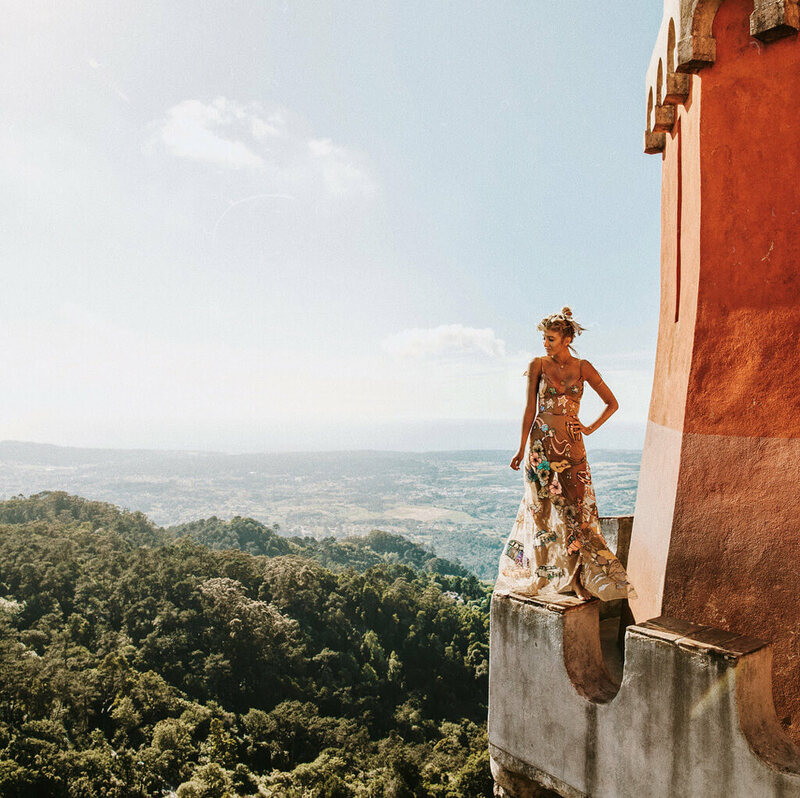 She called herself the Queen of the Castle in this photo and for attempting this, Instagram traveler Lauren Bullen deserves the title! This is quite a daring move and Bullen has picture proof that she has conquered it. This was taken in Sintra, Portugal. She probably wasn’t even scared to scale the edge of this castle tower, but hopefully she was extra careful! After all, that dress she’s wearing could have caused her to trip and fall and one can only guess how long that fall would have been. 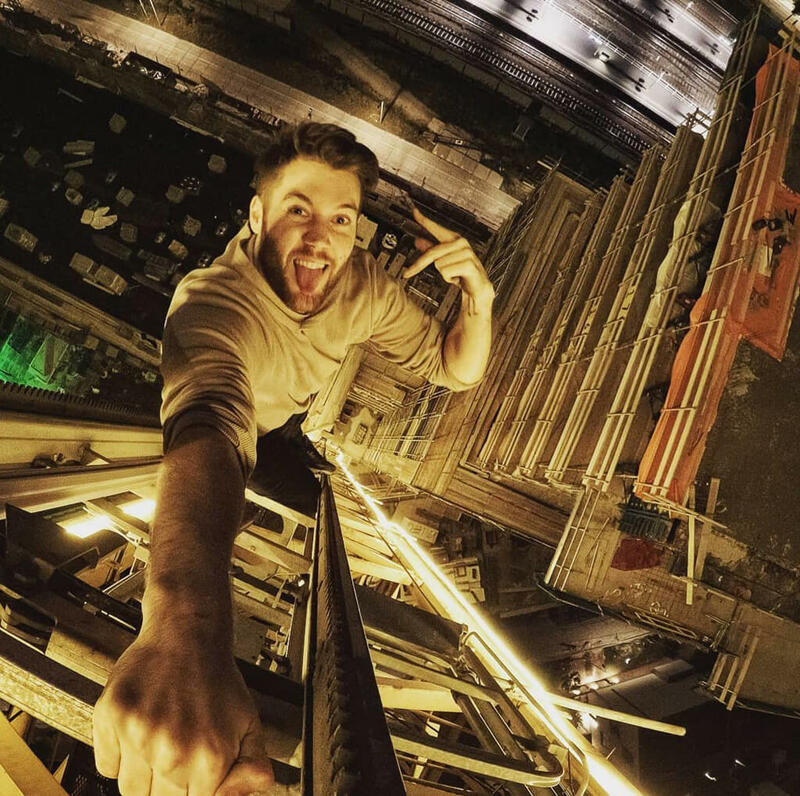 This guy’s name is James Kingston and he just climbed a crane in Amsterdam! 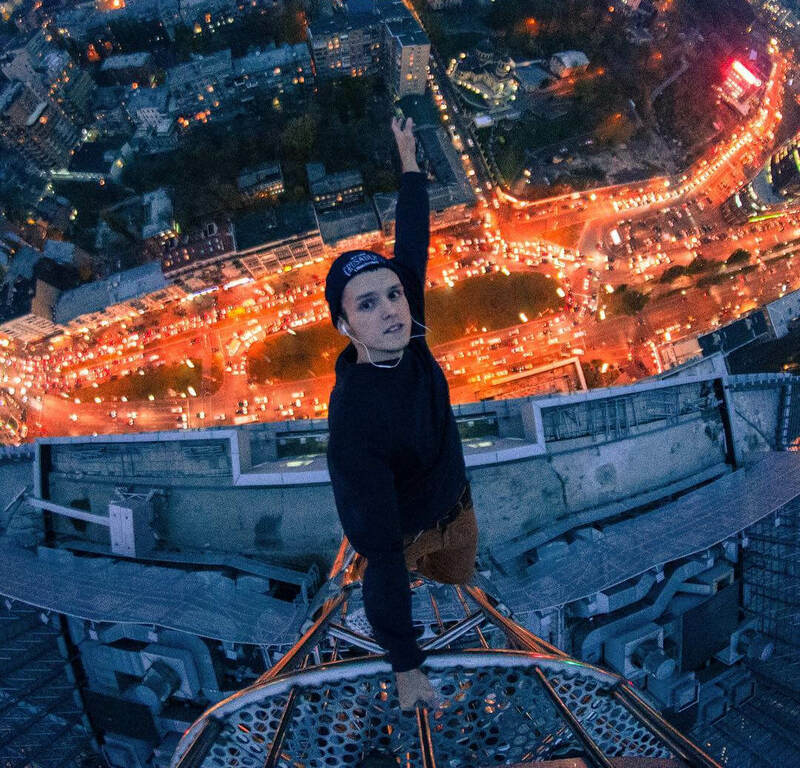 After a death-defying stunt like this, we guess he deserves to pose like that. He did, after all, just conquer a crazy stunt. On his YouTube channel, he takes viewers along on the entire journey. Kingston actually snuck onto a construction site to attempt this and it seems his biggest challenge was to just avoid getting caught! “The goal as always is to get in the site and up as quick as you can,” Kingston says in the video. 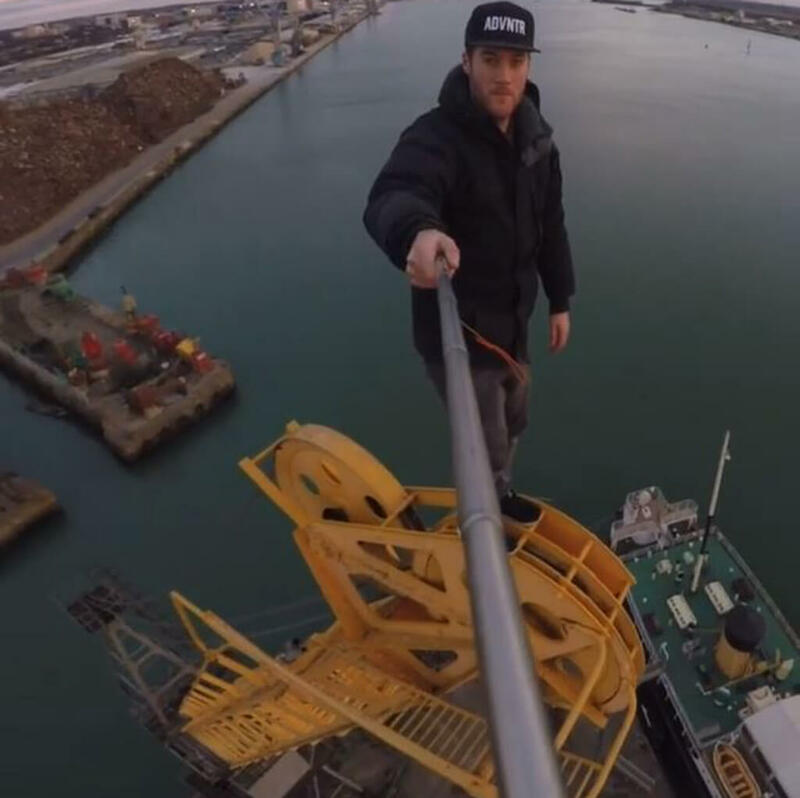 Here is James Kingston on another crane that he climbed in 2016. As you can see, there is barely any support around him so we can only assume that he is hanging by the grace of God! Kingston actually attempts these climbs as a living and came out with a book titled Never Look Down. The book recounts his discovery of parkour, which led to his affinity for climbing very tall structures. 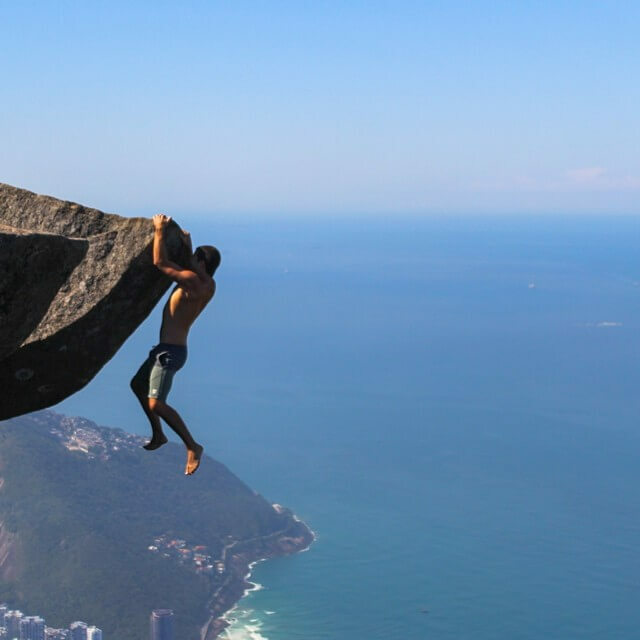 It also recounts how he got over his fear of heights, which is certainly necessary to attempt anything like this! 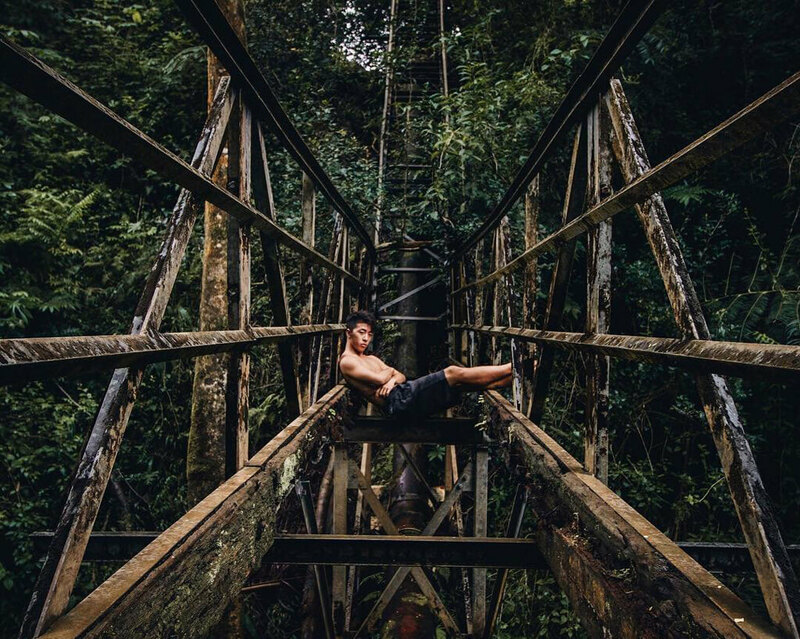 This was taken on an old, rickety bridge on the big island of Hawaii. We certainly wouldn’t have attempted something like this, especially with the bridge looking as run down as it does! One wrong move and this guy could have plummeted to his death. But we’re sure someone brave enough to attempt this would be more careful than that. It must take some serious balancing skills to stay completely still. After all, those beams are pretty thin! 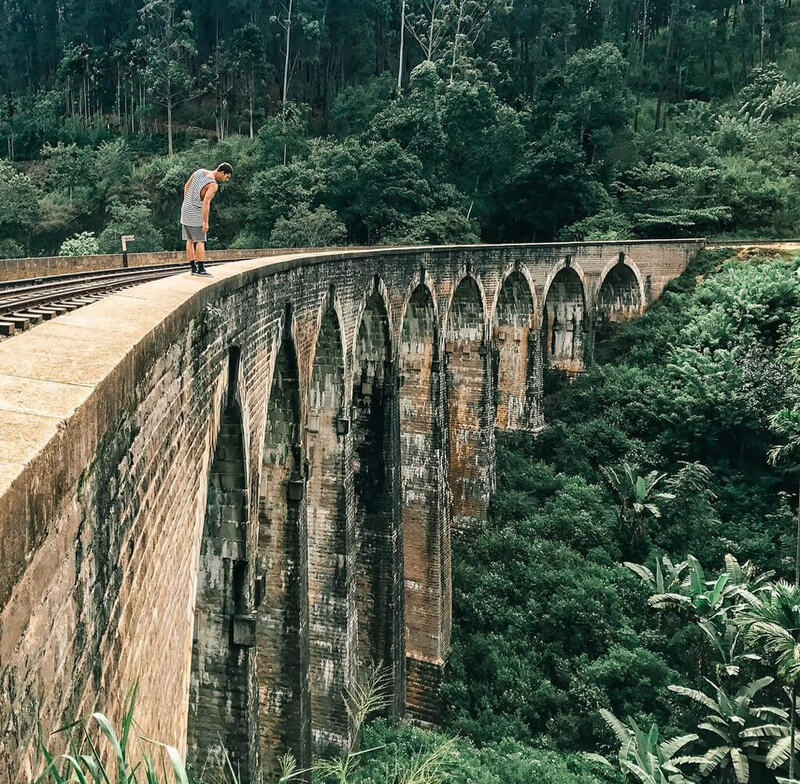 Thiago Correa walks the edge of a bridge in this photo. This is the Nine Arches Bridge in Demodara, Sri Lanka. It’d be scary enough to cross this bridge on a train, which is what its meant for, but it’s probably even scarier to walk on it and be so close to the edge! The bridge is only 80 feet tall, but that’s still quite a ways to fall – if you should ever be so unlucky. There is no steel support for this bridge and it is made entirely out of stones, bricks, and concrete. 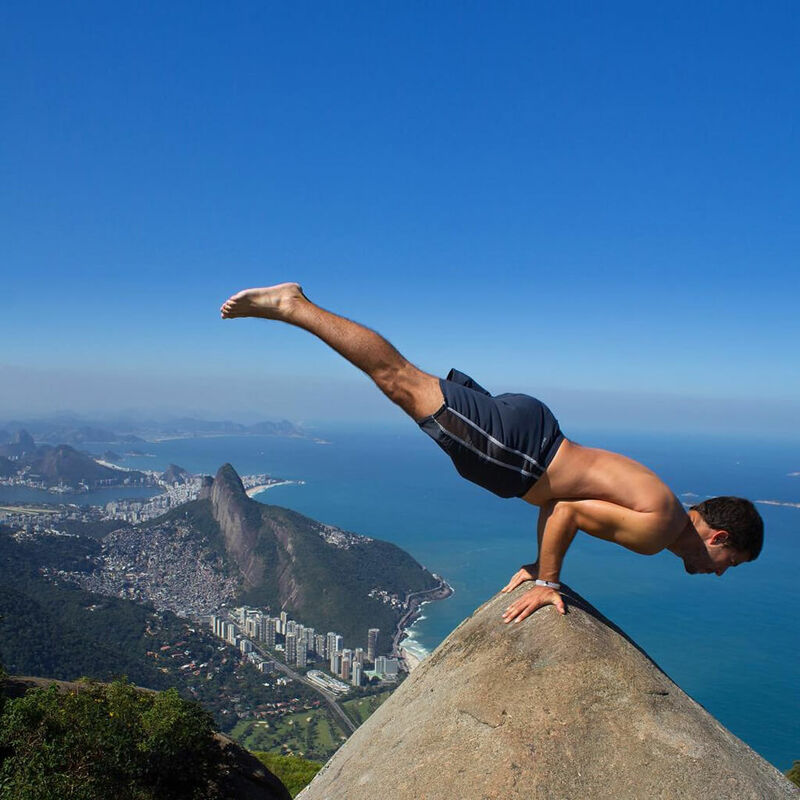 Here is Thiago posing at the peak of Pedra da Gávea in Rio de Janeiro, Brazil. First of all, he must have immense upper body strength to be able to hold himself int hat position. If it was us, we’d see the slope of the mountain ahead of us and would probably fall! 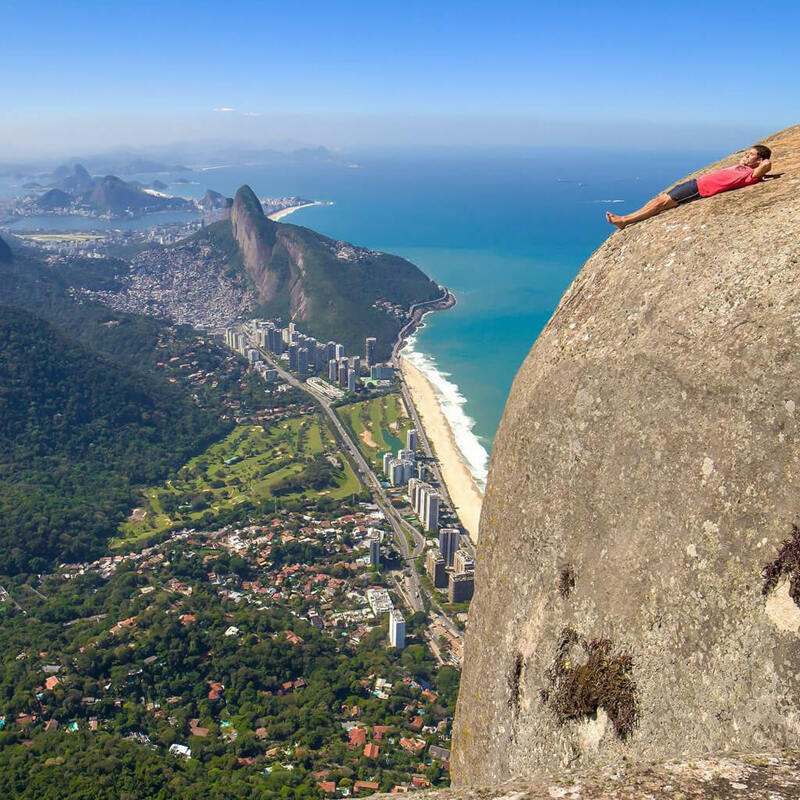 Pedra da Gávea is 2,769 feet tall and part of it falls directly into the ocean. This is a popular hiking spot with trails that have been opened up since the early 1800s. Though many people probably hike this mountain, few of them probably attempt this! Here is another photo of Thiago on the summit of Pedra da Gávea! Would you attempt something like this? He is happily sunbathing on the edge of the summit and doesn’t look concerned at all about slipping a little too far down. If you think about it, it might not even feel like you’re on the edge if you were laying down like that. But one wrong move could mean some serious repercussions. Although being a pro like this guy is, we’re sure he got back up and walked away with no problems. We hope you’re not getting tired of Thiago yet because look at this! Can you believe he attempted this pose on the literal edge of a mountain peak! 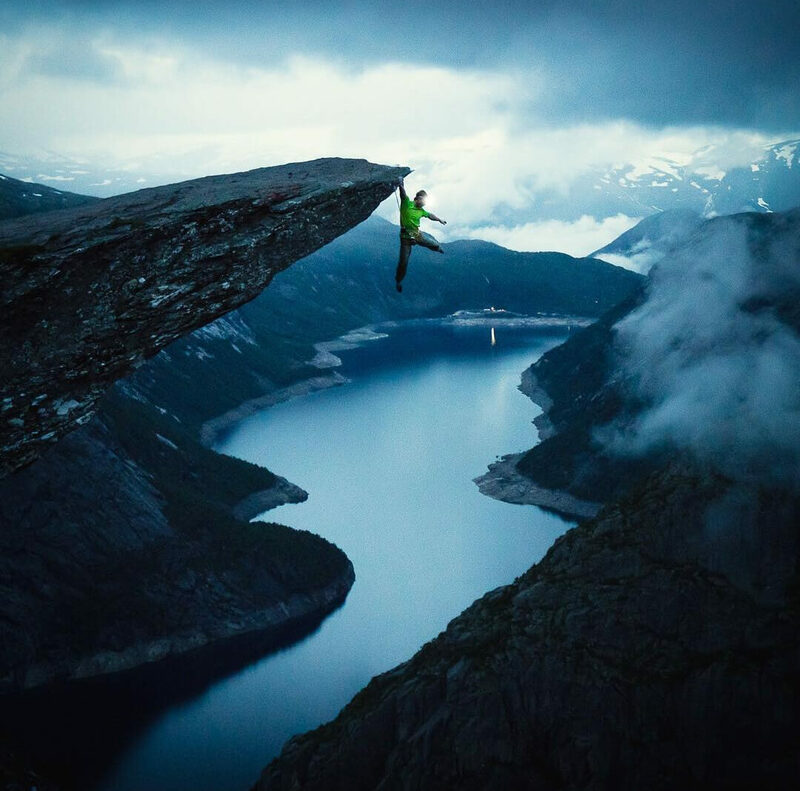 This is the Trolltunga rock formation in Norway. The highlight of the formation is the cliff that juts out over the northern edge of the Ringedalsvatnet lake. The cliff is approximately 2,300 feet about the lake! If Thiago made a wrong move or wasn’t able to get himself back on the rock safely, that would have been a terrible fall. If you were seeking a little thrills yourself, then maybe Thiago can help you! 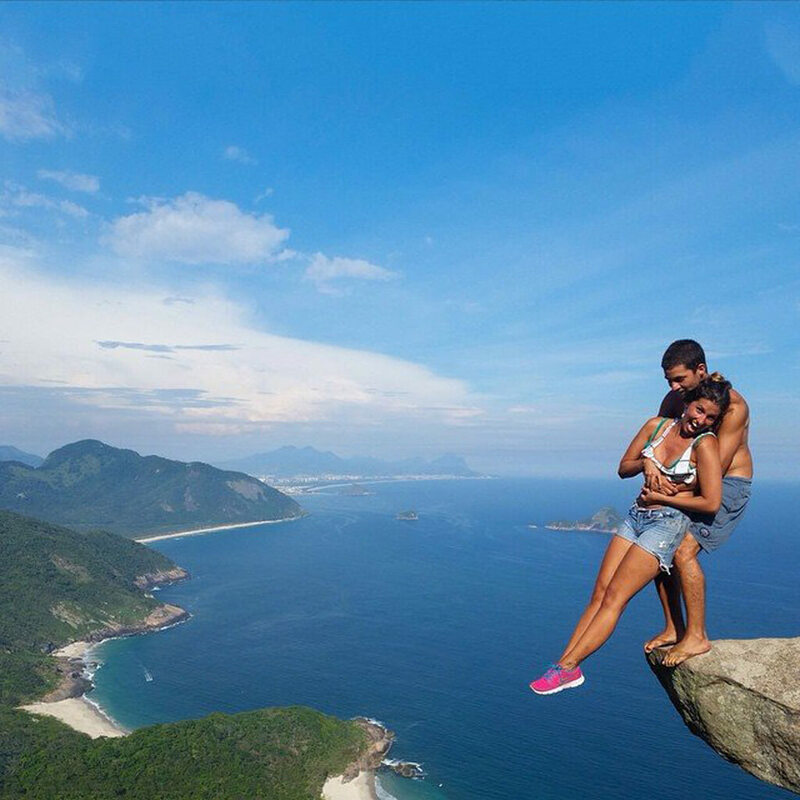 Here he is holding a woman off the edge of a cliff in Praia do Meio, also in Rio de Janeiro. He has proven himself to be incredibly strong if he could carry a whole woman over the edge like that and not drop her! He is even doing this barefoot, which probably is better for the traction to keep him in place. This woman is incredibly brave to put her life in the hands – or arms – of another person! 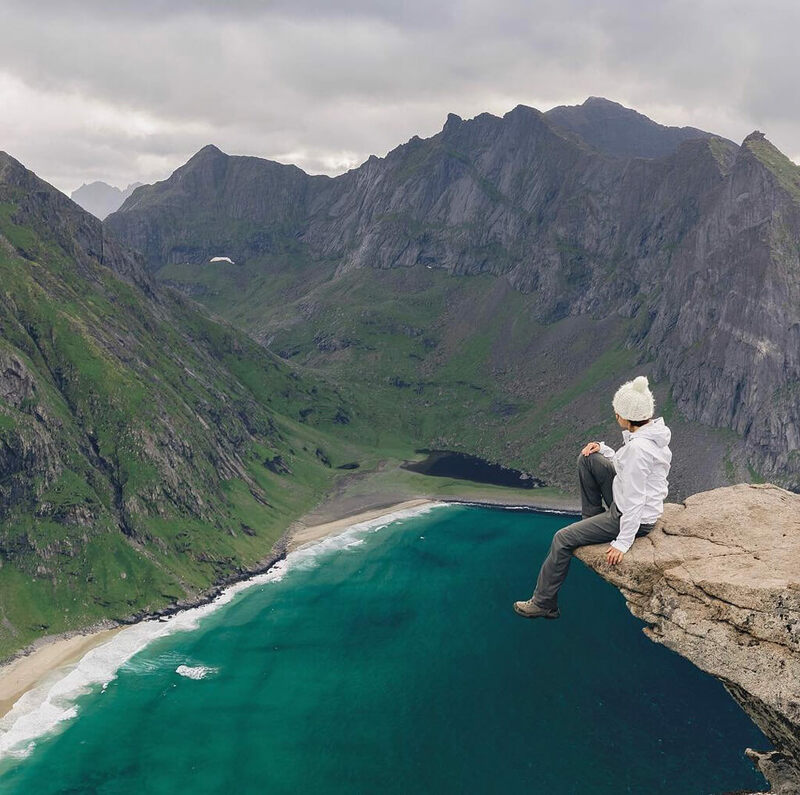 This is a cliff overlooking a beautiful landscape in Lofoten, Norway. 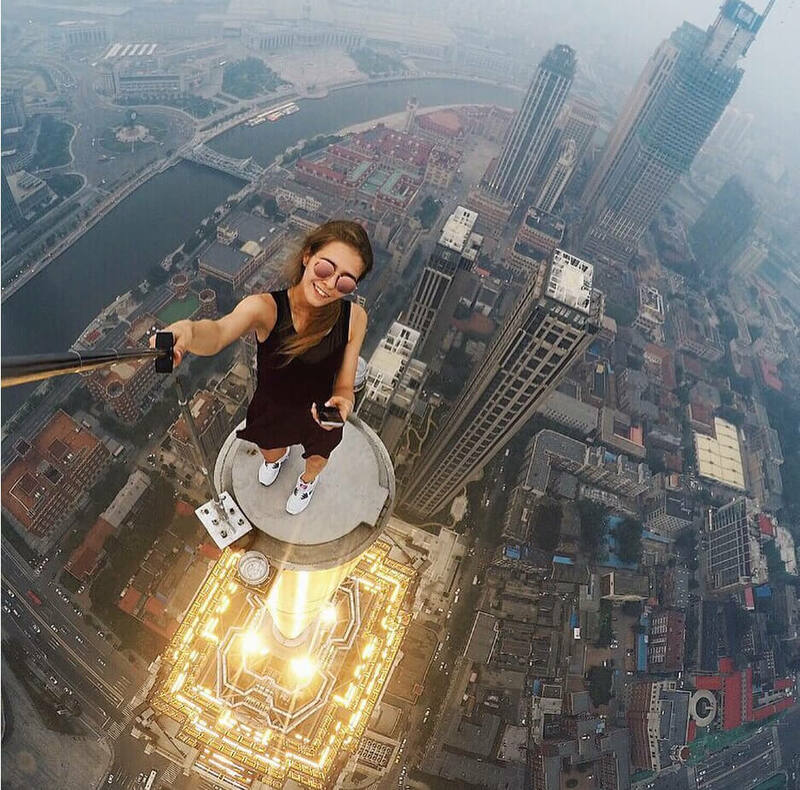 Grace is another Instagrammer famous for her travels and on ocassion she, too, attempts daring stunts that put her at risk of a deadly outcome. But this is one of the more tame photos in this list and we’re sure Grace got out of this with no problems. After all, sitting on the edge of a cliff isn’t nearly as bad as standing on the edge with only half of your feet! Here is Grace atop the “Eight Steps to Heaven” along the mountains in Monteserrat, which is about an hour away from Barcelona, Spain. It looks pretty easy to get to the top, but is probably quite terrifying for those who choke at the sight of heights. Notice how Grace is looking out instead of down, which is probably why she looks completely fearless at the top! This monument offers panoramic views of the entire area. 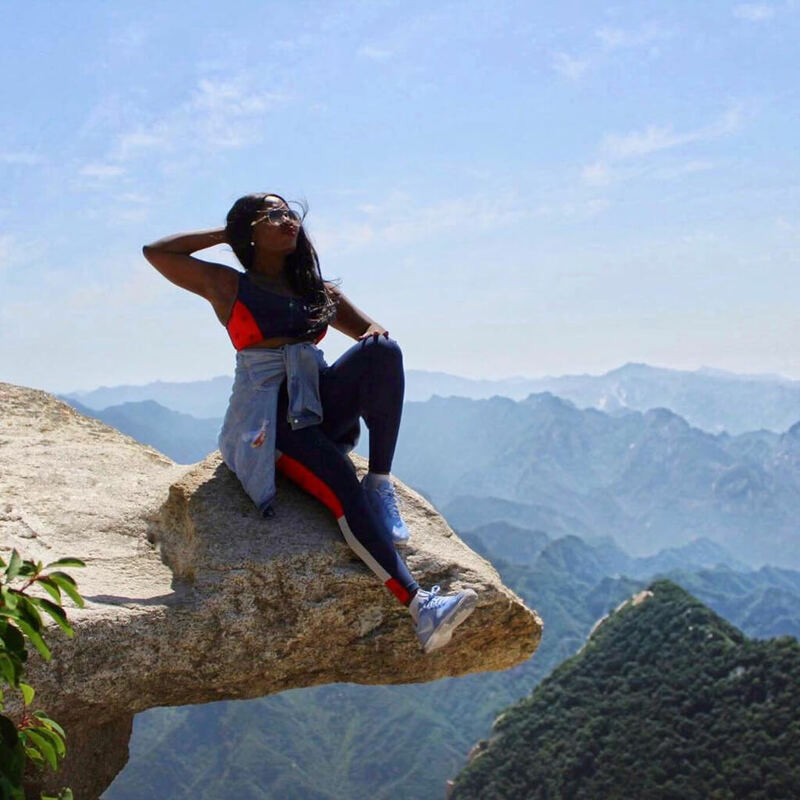 This woman was pretty daring to post on the edge of this cliff on Mount Hua Shan in China. 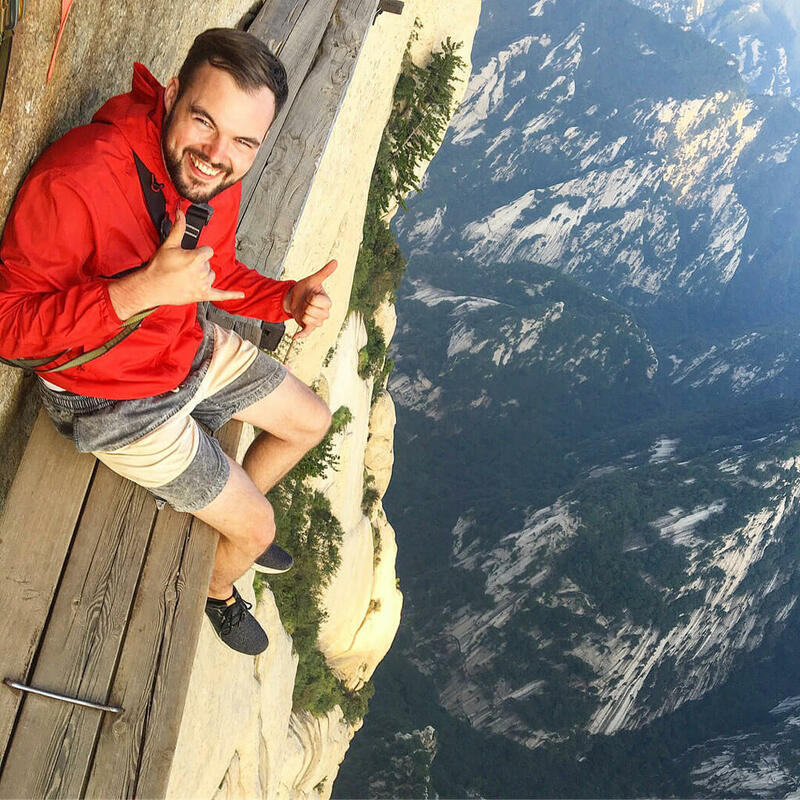 According to reports, there’s a rumor that around 100 people die on Hua Shan every year, although there are no official statistics. The mountain is the western mountain of the Five Great Mountains of China. One of the hiking trails that ascend the mountain has been dubbed one of the most dangerous hikes in the world! Still, many people flock to China to see this amazing mountain range and a few brave souls attempt something like this. Also on Mounth Hua Shan is this questionable ledge that was built into the side of the mountain. Made of wooden planks and kept together with large staples, this lets you skirt the edge of the mountain without falling – if you were so brave. Of course, China tourism is smart enough to not just let people go on this ledge without protection. There is a harness you have to wear that attaches to ropes on the side of the mountain. Even if you are attached, this still makes for an incredibly terrifying experience! 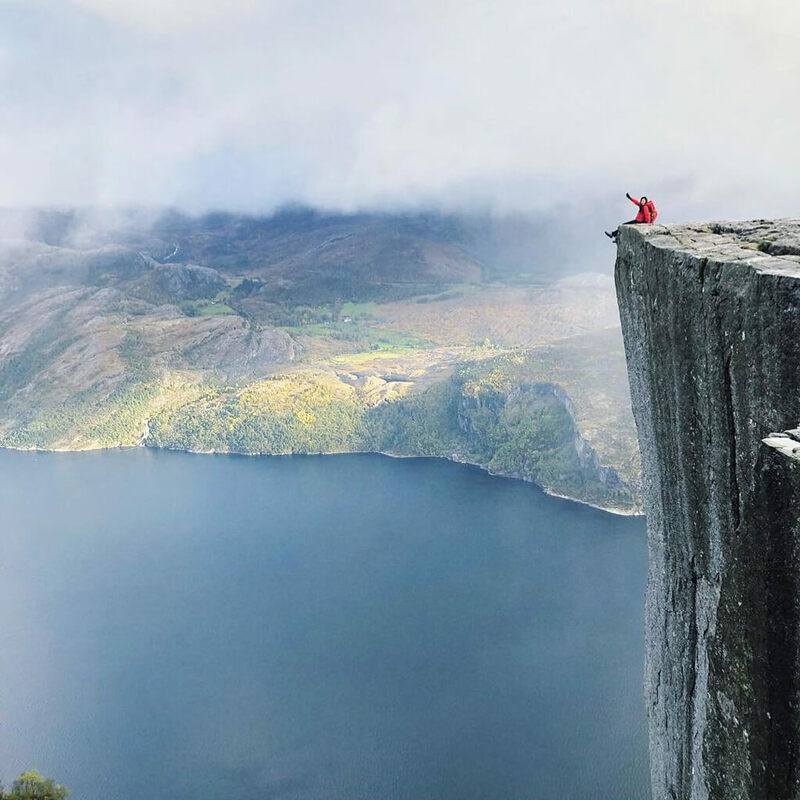 Would you sit on the edge of this enormous cliff in Norway? This is called Preikestolen and it is a popular tourist attraction in Norway. 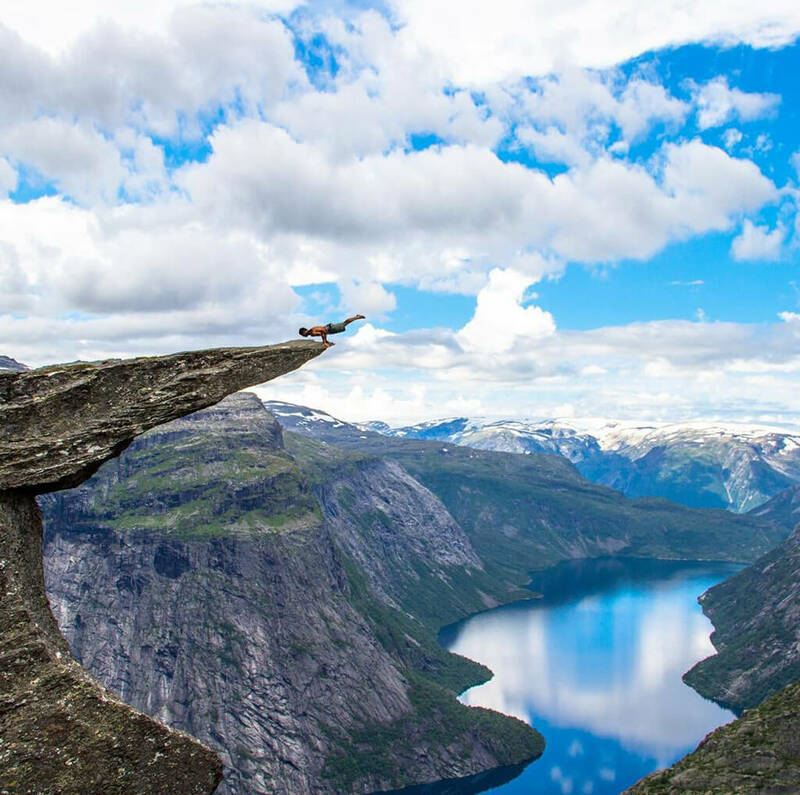 This steep cliff is almost 2,000 feet high and it sits just at the edge of Lysefjorden fjord. The top of the cliff is almost square, at 82 by 82 feet, so at least there’s a lot of room to move around at the top. The real challenge there is going as close as you can to the edge in order to get your picture! 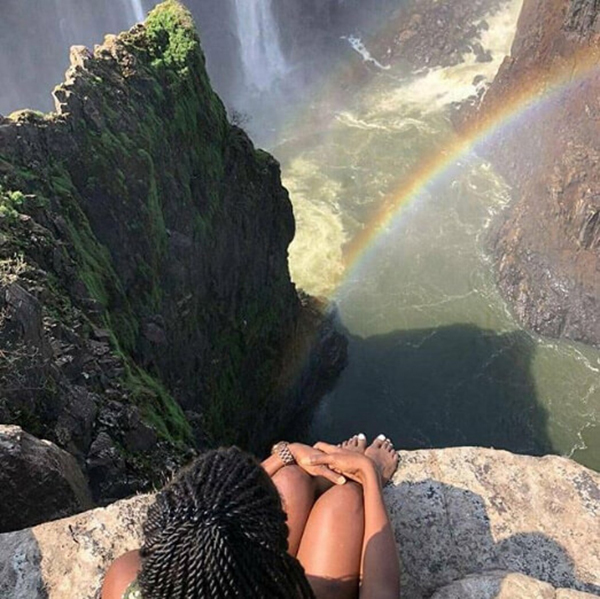 This is Victoria Falls in Zimbabwe. Despite multiple reports of people dying from having slipped on accident, people are still brave enough to travel here and see this amazing gift from nature. The waterfall is one of the main attractions when visiting Victoria Falls. These falls are considered the widest largest in the world, spanning a width of 5,604 feet. Though they are only 354 feet high, the rapid waters would surely push someone to an unfortunate death. This is the world’s largest sheet of falling water. You might be wondering, “Who would be so crazy as to swim at the edge of a waterfall?” Well, this is your answer. This guy is literally swimming in danger but at least he’s having fun! This is the Devils Pool area of Victoria Falls and tourism authorities allow people to swim in it if the water levels are low enough. 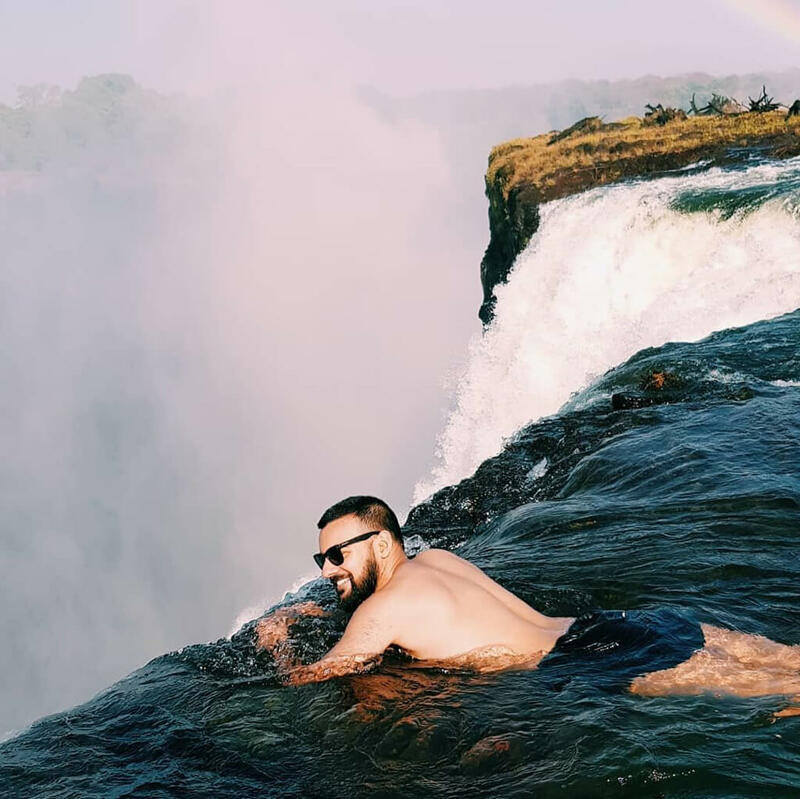 If you need to visualize just how dangerous it’d be to fall over, Victoria Falls is twice the height of Niagara Falls in North America! These people were dancing with the devil indeed.